We arrived late at night in the picturesque medieval town after a heavy downpour. The streets were quiet, dimly lit with rays of light reflecting off the damp cobblestone pathways. My phone told me that the hotel was just a minute walk away - the town was so small that my little blue dot moved at astonishing rates. Among the world's 10 best preserved medieval walled cities is the beautiful seaside port of Dubrovnik, Croatia. Sitting on the coast of the sparkling mediterranean sea, Dubrovnik served in ancient times as a resting port for ships at night. The “Old Town”, as they call it, with its red roofs and creamy beige architecture, is entirely surrounded by walls up to 25 meters high. Often and repeatedly under attack for control by many neighboring states, it's turbulent history involved a great fire that destroyed nearly the whole city in 1296 and a month long siege by the Napoleon Army that led to 3,000 cannonballs being fired onto the city. Today though, the Old Town has been restored in all its glory. entrance to the "Old Town"
Stepping foot inside the "Old Town" felt a bit magical. With nearly all the original architecture intact, I stood there envisioning how life would have been back hundreds of years ago, the people that crossed this very same street everyday...sailing, trading, living. Would they have been all that different from you and me? and palaces with magnificent architectural designs. Unsurprisingly, Dubrovnik’s greatest achievements were in the field of marine technology and sea trade. Ivan Rblijanin once lived there as one of the most famous cannon and bell founders of his time. Sea chests made in city boasted some of strongest and most advanced locking systems. Huge fleets of merchant ships called Argosies travelled all over the world, founding even some settlements in India and America. Unfortunately, as many treasured old cities and cultures around the world, Dubrovnik has become increasing touristic. For the first time, I finally understood why history was so important. Increasing globalization, especially in cities today in Asia, has so quickly erased memories of our past. Culture and civilization will forever be changing, and waves of technology and innovation will inevitably destroy in their paths cultures and past ways of life. And so it's imperative that we pass along stories of the past and where we came from, and do everything possible to preserve and remember. Otherwise everything will forever be lost. Despite Dubrovnik’s turbulent history, the city itself always aspired to live in peace and freedom. It believed in free trade, with its ships sailing a white flag with the Latin word for freedom, Libertas. Even its prison system was seen as quite revolutionary as some captives were only imprisoned during the day and was allowed to return home at night to their families. Today, the city is now protected in UNESCO list of World Heritage Sites and has a steady population of about 42,000 with tens of thousands of visitors per day. We docked at the Port of Venice, met with thundering clouds and a flash flood of rain. Temperatures dropped and the wind came. A blanket of clouds covered the city and a whole new set of colors emerged under the grey blue sky. 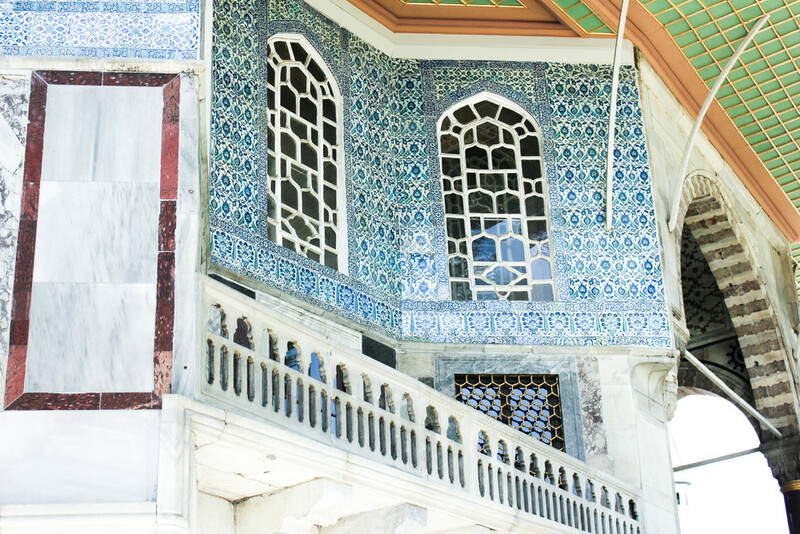 The Ottoman Empire was one of the grandest and most powerful in the world, and the Topkapi Palace was a testament to its influence, size and power. Separated into two main parts, the main palace housed the Imperial Council, Treasury, libraries, schools, courtyards, mosques, and gardens, while the Harem was the private residence of an extensive royal family where the Queen Mother (the Valide Sultan) reigned. She, in many ways, was the most powerful of them all, influencing her son in politics while also regulating important relationships within the royal family. The palace functioned like a mini city, where the royal family lived in general seclusion rarely ever stepping outside its grounds. In the Harem, hundreds of concubines, hand picked as the most beautiful and talented women in the world, entered the royal palace at a young age. They were educated music, art, dance and royal manners, in their preparation to become Guzdas, or the future wives of the Sultan. Black Enuchs, who delivered messages and carried out royal orders, held considerable power, with the Chief Black Enuch being the fourth most powerful in the political hierarchy, closely attending to the Sultan and involving himself in daily affairs both in and outside the palace. I soon realize that the royal family, palace, practices and hierarchies of the Ottoman Empire closely paralleled those of the Imperial Dynasties of China. The Sultan was 皇上, the Valide Sultan 皇太后, the Harem 后宫, the concubines 佳人, and the eunuchs 公公, all of which had nearly identical roles, traditions and relationships within the royal family. As I looked out from the palace, I couldn't help but wonder how two distinct civilizations on earth could independently produce such extraordinarily similar customs, values and traditions. This, for me, was history’s attestation that despite human nature's perpetual need to differentiate “us” from “others”, all of us, regardless of race, origin or religion, will forever be more similar than we will ever be different. Before you think I'm finally going to explore the far distant lands of Venice, Italy, I have to first manage some expectations and tell you that we are merely spending the morning here. Venice is a major port on the mediterranean, and that is the only clue to where I am headed for the next week! While it's is no long distance trip from Paris, here are some essentials I always bring with me on the plane (and elsewhere on vacation ;) ). Bag - this will fit everything! Sunglasses - oh there will be sun! Passport - can't leave without this one! Mentos Gum - favorite mint now in gum form! Kusmi Tea in Earl Grey - this gift size container is the perfect travel companion! Contact Case - with solution already inside! Good bye Paris! See yah in a week! The South of France. Le Sud de la France. Any mention of such a land immediately conjures images of a peaceful picturesque countryside with creamy French architecture bathed in a sea of warm afternoon sun. A stroll along the winding paths. A peep into the many fait maison (home made) artisan boutiques. A conversation over a glass of rosé on a rooftop overlooking the sun setting over the montagnes. It does not get more romantic than that. "We cannot talk about Bordeaux wine without talking about ze terroir," our tour guide articulated proudly with her thumb and index fingers together, stressing the r's (arhhhh's) in her last word. "Bordeaux's vineyards are deeh-vided into 60 appellations (regions) of 284,000 acres. Each type of wine is adapt-zeed to its region and...terroir (-arhh). You cannot make Margaux wine in Saint-Émilion. No no! You must make Margaux wine in Marrhhgaux. The Margaux wine varieties have been adapted to ze terroir (-arhhhh). Any-zing else will be no good." She looked at us. "You understand?" It was a 45-min drive from downtown Bordeaux to the Châteaux (literally castle, but here meaning entities of vineyards, usually 100-150 acres, owned and operated separately either by families or now, modern day companies of shareholders). On many of these vineyards still sit castles of all sorts, which back then hosted the families who owned them as country estates away from the city. Today, we were just 20 miles northwest of the city of Bordeaux, in the region of Margaux, famous for producing some of the best red wines in the world (or should I say ze :P). As we drove past hundreds of acres of vineyards, we learned that Romans first planted them 3000 years ago. During this extraordinarily long history, the wine varieties such as Cabernet Sauvignon, Cabernet Franc, Merlot and Malbec, were especially created for the specific terrain of Bordeaux. And so despite being planted elsewhere in the world, they will never produce as well as here in France. My immediate impression was that the vines all appeared much shorter than I had imagined, just 1-2 meters above ground. Apparently, because Bordeaux wines are known to last a long time (up to 3-4 decades), this requires that the juice be more concentrated than others, to allow for the gradual thinning of taste without loss of body or flavor. To accomplish this, Bordeaux vines are pruned extraordinarily short, resulting in the production of much less, but far more concentrated juice. Bordeaux Vineyards - it's hard to get a picture just driving! They are highly protected from people walking through them (mostly forbidden) to ensure the highest of quality. In a country obsessed with everything natural (GMO's are banned entirely), it's not a surprise that Bordeaux vineyards are never irrigated. This is called the hydro-stress method, which forces vines to grow enormous roots of 8-12 meters into the ground to find water. The average around the world is just 3-4 meters. Most châteaux produce their wines on site, from harvesting to fermentation to aging. And so in these enormous barrels (many of which are now steel instead of wood to facilitate cleaning), the grapes are canned for fermentation. It was surprising to see how clean and high-tech these facilities were. In Margaux, drones are used to take pictures of the vineyards from above to differentiate the already ripe grapes from those still needing some time. And of course the aging process, which takes place in these oak barrels (each of which costs up to 900 euros, and changed every couple of years), helps to add that wonderful oak flavor to the red wine. And the most important thing that I learned on my tour? That a wine from Bordeaux is never just a Cabernet, or a Merlot. It's always always a blend, and named only after its appellation. So next time you see a wine named Merlot, you know it's definitely not from Bordeaux (or France)! We went on the Ophorus Wine Tour, which was excellent. This post is part of the 12-day, 5-city Eurotrip in July 2014. The train emerged from the dark tunnel, and we gasped as the enormous pacific ocean came into full view. Getting off the train, signs indicated a 5-minute bus ride or 365-step stairs climb (20 floors) to our village, called Corneglia. 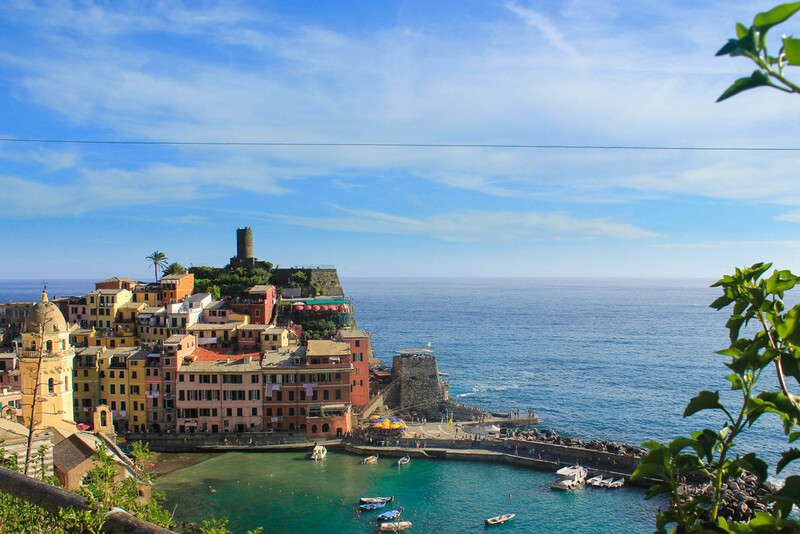 Corneglia was the smallest of all five villages, collectively (and appropriately) called Cinqueterre, a mountainous region off the western coast of Italy, 265 miles north of Rome. Just one main road connected all the village’s inhabitants along the cliffs of the mountain, with yellow, pink, and orange architecture that contrasted vibrantly with the lush green forests and aqua blue ocean. Upon entering our host's home, a white-haired Italian couple welcomed us with bear hugs and passionate Italian. Between M’s Spanish and my French, we managed, albeit very slowly, to decipher the basics, such as how to get to the ocean and where and when we were to have breakfast the next morning. Hiking was the first thing on our agenda. An 8-hr hiking trail in the mountains connected all five villages. Unfortunately, 3 of the 4 trails were closed due to landslides, so we decided to take the train to Vernazza to hike to Monterosso. After sharing a plate of the local speciality pasta Trofie served in delicious pesto sauce, we followed signs through tiny alleyways and eventually a steep dirt path that wrapped around the mountain. We left at 6:30pm, hoping that we could make it out to Montecarlo just around sunset. It was a steep climb with narrow pathways on the outer edge of the mountain. The weather was perfect in the low 70s and not too humid. We stopped for pictures here and there, but were amazed that the view only got better. Slowly, the village of Vernazza faded into the distance, and disappeared as we turned a corner. It was beginning to get darker and cooler, and we found ourselves alone, just the enormous mountains and ocean around us, and no people or civilization in sight. We continued along, now less talkative, focusing on getting across to the other side. “J, look!” M gasped as she pointed at a small stray tabby with wild eyes, meowing at us for food*. We only had a precious bottle of water on us, and so looked at her sadly and continued on. After a few more ascends and descents, we finally saw a house here and there in the mountains, hinting at civilization. A soft rustling in the shrubs next to me caught my attention, and a lizard climbed out and disappeared again. After dark tunnels through forests, a bridge over a small waterfall, and hundreds of steps of descent, we finally arrived at Monterosso, greeted by a posh modern French restaurant overlooking the ocean, the perfect evening reward for our hike.